*This is a sponsored post. The pack and I received a box of goodies from Helen Woodward Animal Center in exchange for spreading awareness about adoptable animals waiting in shelters. All opinions and words expressed here are mine and the pack's!We write because we think what we have to say will have some value and interest to our readers. There are no affiliate links in this post. 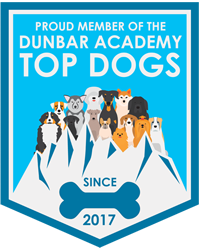 When I attended BlogPaws in Myrtle Beach this past May (at the beginning of summer! ), I was fortunate to meet up with the folks from Helen Woodward Animal Center. At first, I thought their Remember Me Thursday campaign focused on memorials for lost pets, but I quickly learned that the pets they are remembering are the ones stuck at shelters throughout the U.S. waiting for someone to adopt them and give them the lives they deserve, safe and secure; loved and cared for; forever. To help spread awareness for the #RememberMeThursday #RememberTheRescue campaigns, they were kind enough to send me a blogger's kit so I can help them with their campaign. I shot some video of me unboxing the kit, and you can watch that below. I've been rescuing pets ever since I was a child. Too many pets to count. 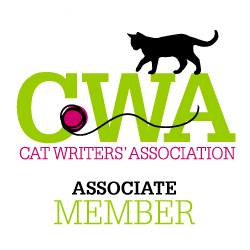 You can see my past pets on the Traveling Dog Lady website: Dogs are here; cats are here. This is just to give you an idea of how long I've been actively rescuing adoptable and unwanted pets -- even before it became "trendy". Everybody already knows the stories of both Charlie Brown and Cooper, my current dogs that came to Massachusetts from Tennessee via Great Dog Rescue of New England. GDRNE is an organization that is near and dear to my heart. I volunteer for them, processing intake forms for dogs about to be transported to New England from southern states where there are high-kill shelters. We are fortunate to live in Massachusetts, because there are few (if any) kill shelters here. Great Dog is a shelterless rescue, which means that all dogs go immediately into foster homes. Litters get fostered together, with their mama dog, until they are weaned and ready for adoption. Because of my unique volunteer position, I get to see every dog that's on its way up to New England before anyone else. Let me tell you it is so hard not to want to adopt every single last one of them! Not only are they cute, cute, cute, but their stories tug at my heart every time. Even the littlest ones who usually arrive here as a whole litter, just like my hounds did nearly 6 years ago. Then, there are the cats. 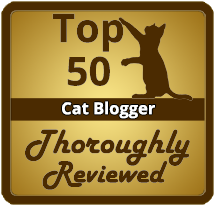 Again, you probably know the story of my three current cats, Cali, Tux and Newman. They were all motherless kittens that my friend's daughter found on three separate occasions. It is unclear whether they are related, or not. Since they were all found at approximately the same time, one would think they are related, but apparently they were found in three different locations. In any case, she bottle fed them, and was going to keep them, but then she realized she was having her own (human) baby, and they didn't want cats in the house with the baby for whatever reason. When asked if I wanted to adopt ONE of them, I told her I'd take all three.... sight unseen! It's hard to believe they are eight years old already. Seniors!? These are just three of the DOZENS of cats I've rescued and shared my life with. Yes, I was a crazy cat lady before I became a crazy dog lady. Although, I have had both dogs and cats my entire life. But I can't adopt them all, and that's where you come in. 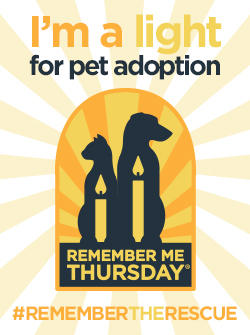 Help raise awareness for the plight of forgotten animals in shelters by participating in the #RememberMeThursday campaign on September 28, 2017. 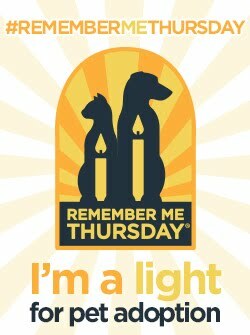 Use the hashtag #RememberMeThursday and #RememberTheRescue when sharing about the event with your friends and followers. 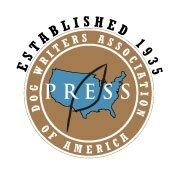 I write to save lives! Counting down to #RememberMeThursday on the left side of my computer screen. On the right is PetPoint, the database for dog and puppy intakes for Great Dog Rescue of N.E. Framed photos of all my dogs, including Hector (l) and Hobie (r) give me encouragement while I work. 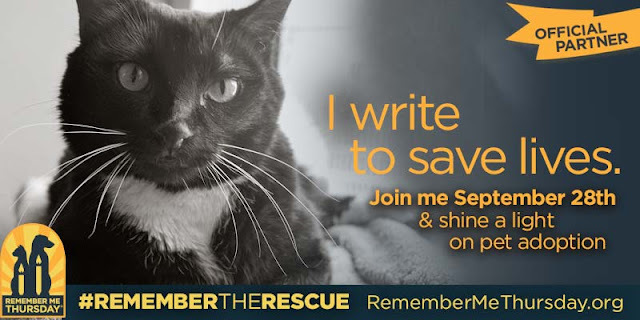 Don't forget to enter the #RememberTheRescue photo contest! Winnings go to your chosen shelter. The contest is on now, through September 30th, and you can find out more details here. Join us in lighting up social media on September 28th. Use the hashtags mentioned above, and light a candle for the forgotten animals that need everyone's help. You can light a virtual candle or a real one, or one of the handy battery-operated candles as shown in my video. and join the contest today!